Galaxy Suites is a 4-star hotel located in the picturesque and well known Imerovigli village and at the highest point of the Caldera. Enjoy the magnificent view to the Aegean sea, the volcano and Thirasia island, the village of Oia and of course the absolutely magical sunset! Built and decorated according to the traditional style, Galaxy Suites offer more that just tradition. Great comforts and relaxation in true luxury are only the beginning! Our luxurious one bedroom traditional cave suites, with queen beds, hydromassage, can accommodate 2-3 persons. All the traditional cave suites have a large shared veranda with a view to the Caldera, the Aegean Sea 300m below, the volcano and the island of Thirassia, the traditional village of Oia, the Cycladic islands and the magnificent sunset. The Modern Suite is suitable for accommodating 2 persons and offers guests a big bed with a handmade mattress. Its decoration features the traditional Greek style elegantly mixed with modern lines. An arched way shows you the route to a magnificent sea view while a private terrace with an outdoor heated jaccuzi on the highest hotel level can make you feel absolutely comfortable and relaxed as if being in a dreamy world. The VIP cave suite (100 Sqm) is spacious, clean and luminous. It consists of 2 bedrooms with vast beds, 3 bathrooms, hammam, indoor heated Jacuzzi. It takes comfort to the highest level; lay back on a handmade mattress, dip into your private indoor heated mosaic jacuzzi, and afterwards, take a walk out to the shared terrace and marvel at the incredible Caldera Sea View, making you feel as if you are on top of the world. 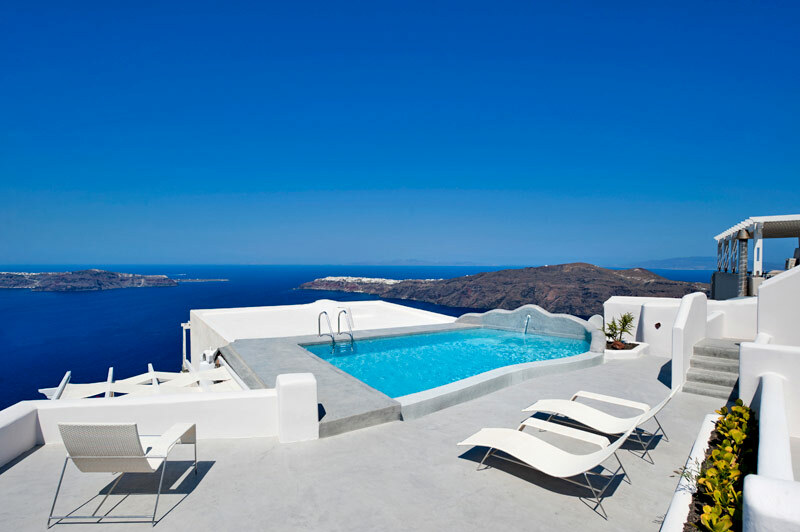 Galaxy VIP cave suite (150 Sqm) is one of the largest deluxe cave suites of Santorini. It is spacious and luminous, composing of 3 queen-size bedrooms, 4 bathrooms, hammam, indoor heated Jacuzzi. It takes comfort to the highest level; lay back on a special handmade mattress, dip into your private indoor heated mosaic jacuzzi, take a walk out to the large shared terrace and marvel at the incredible Caldera Sea View, making you feel as if you are on top of the world.